This guide is intended to help you get started with Universal Office. It walks you through the most frequently used features (performed tasks) by Office Administrators. You can search for patients by First and Last name, or by other specific search criteria such as Patient ID, phone number, case ID, status, or case type. Note: By default, the system will search by the patient’s Last Name. Type in the Search box at the top-left, then press Enter or click [Search]. To search using another criteria, click the arrow next to the [Search] button and select from the list, then hit Enter. Select a patient from the pane on your left. Select a case at the bottom-left of the screen. Tip: To return to the full list of active patients click [View] on the toolbar. Note: In Universal Office, mandatory fields are highlighted in Pink. For additional information about managing patients, please refer to Patients and Cases. Click the [New Patient] button on the toolbar. Click [Save Patient] on the toolbar. Click on [View Cases] or anywhere inside cases box at the bottom-left. 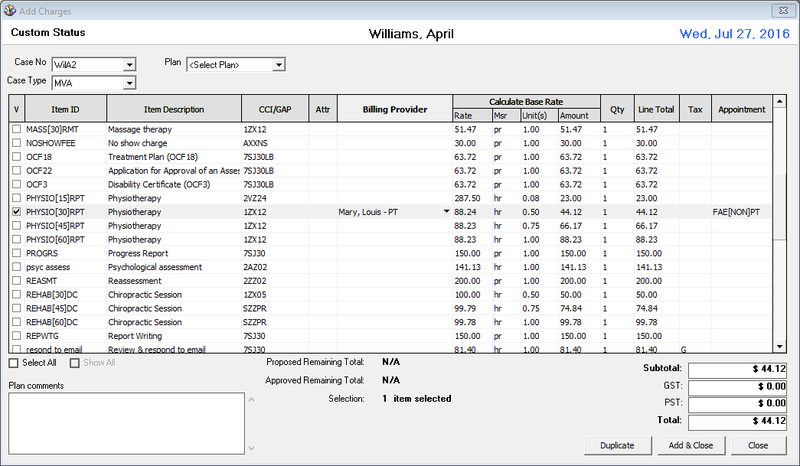 The right side of the Patient Manager changes to display case information. Click [New Case] on the toolbar. 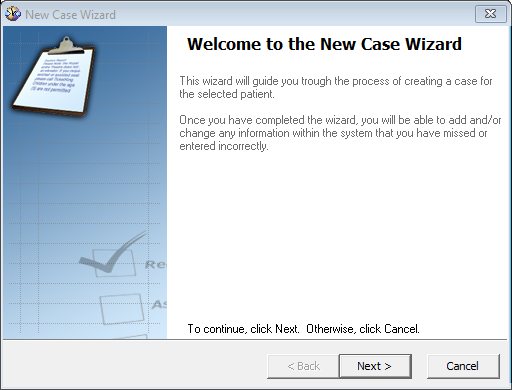 The New Case Wizard opens. 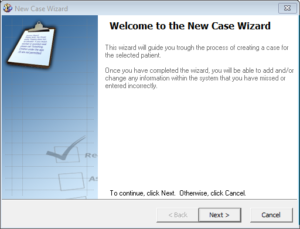 Follow the Wizard to create a case, then click Finish. creating a series of repeated appointments. In this section, we will cover creating an appointment without charges. That happens to be the fastest way for scheduling appointments. To learn more about scheduling appointments, see Schedule Appointments article. Select a date from the calendar on the right side of the screen. Use the search box in Patient section to find a patient by last name. Tip: You may also search patients by first name, phone number and case number. Select a patient, then select a service to schedule from the Activity drop-down list. Double-click on an available (light-grey cell) time slot in the Appointment Book. When scheduled, the system assigns an unconfirmed status to appointment. You may change the appointment status as patient checks in or cancels an appointment. Unconfirmed Returns the appointment to Unconfirmed status from any other status. Confirmed If you practice confirming appointments ahead, you can mark appointments confirmed in your Appointment Book. Patient Check-In Check patient in upon arrival. Mark as Missed When you have a no-show, mark appointments as missed. Mark as Canceled When patients call to cancel appointments, mark them as canceled. You may choose to notify patients by email when you schedule or cancel appointments as well as send 24-hour appointment reminders. the patient must be subscribed to receive emails (the Subscribe to email notifications box must be checked in the Addresses section of the patient’s profile). Lets look at how to add charges per appointment. Double-click on a Checked-in appointment. The Apply Charges window opens. Under the Billing section select a case, then click [New Charge]. The Add Charges window opens. Note: Depending on preference settings, you may have a list pre-populated with services and products or a blank list that allows you to select items, one for every row, using the Item ID column. To customize the list preference, see How to modify the appearance of the Add Charges list article. For each selected item, chose a valid Billing Provider. To collect payment after a patient visit, you will want to first record charges as described in the above section and remain on Apply Charges window. 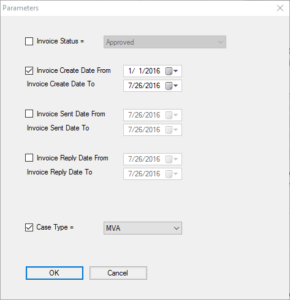 While in Apply Charges window, click Create Invoice. 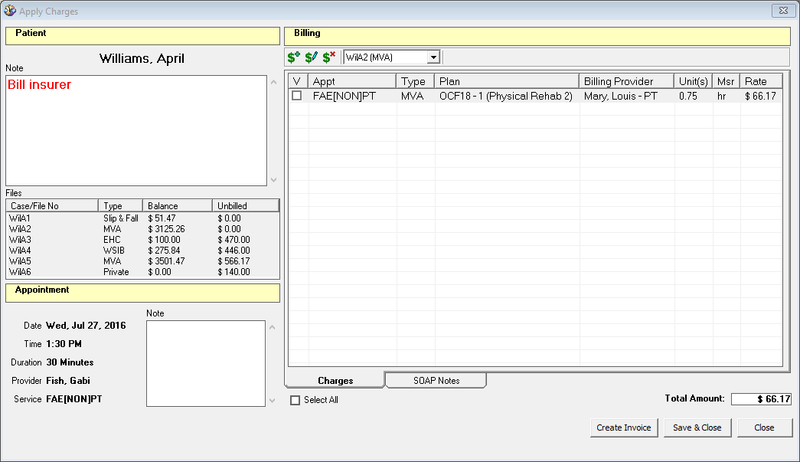 The invoice editor opens pre-populating invoice with added charges. Note: The screen may vary depending on patient case type. Make sure the Record Payment box is checked, then select the payment type under Pmt Method column. Tip: When payment was split into two or more payment types (for example, Cash and Credit Card), adjust the payment amount under the Pmt Amount column then select another payment type on the next row under the Pmt Method column. Note: The payment date defaults to today’s date. To change it, select a date under the Pmt Date column. 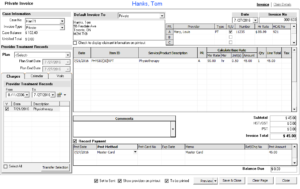 Click Preview, then print the invoice with a PAID stamp and hand it to the patient. Close the invoice preview, then click Save & Close in the invoice editor. The process of creating invoices for different case types (EHC, MVA, and WSIB) is similar. 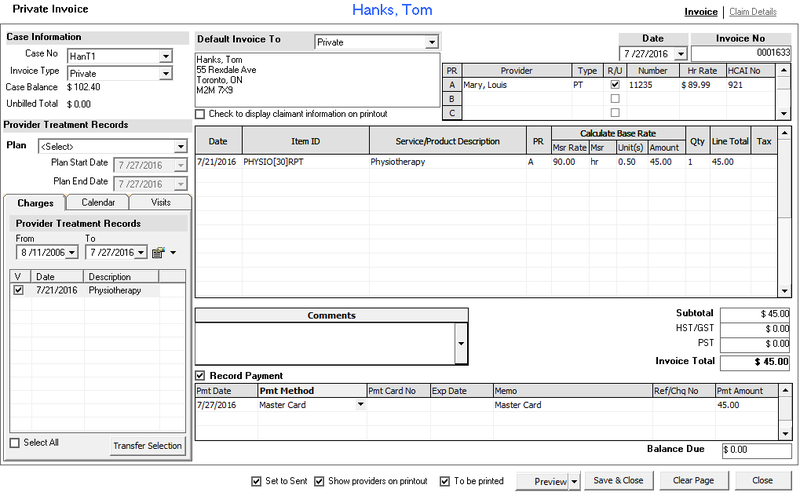 In this section, we will walk through creating a Private invoice. Note: To create other types of invoices, see Billing and Collections section in our Help Centre. In the Patient Manager, locate and open patient with a Private case. Select the case, then go into the Account Activity tab. Note: By default, the Invoices & Payments tab opens under Account Activity. From the Template type drop-down list, choose Private, then click Open. Note: You must associate a valid provider per billing item. 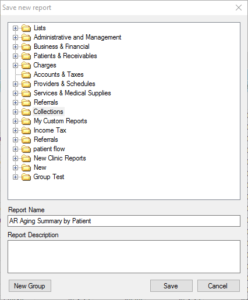 In the Patient Manager, locate a patient, select case, then open the Account Activity tab. Click the arrow next to [New Invoice/New Payment/New Refund] on the toolbar, then click New Payment. 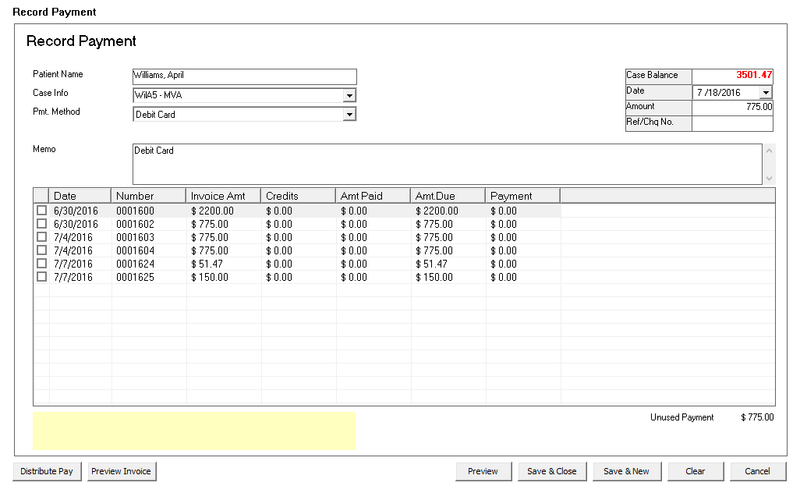 The Record Payment screen opens, displaying a list of outstanding invoices for selected case. Select a payment method from the Pmt. Method drop-down list. Select the payment Date and enter the Amount in the top-right corner. Check the box next to outstanding invoice. When prompted, confirm payment amount. Repeat steps 5 and 7 to allocate the payment to more than one invoice. In the Patient Manager, make sure a patient is selected. Click the arrow next to [Print] on the toolbar, then select Blank Intake Form. Note: The Patient’s Intake Form option, will pre-populate the intake form with available information for the patient selected on the left. Click the arrow next to [Print] on the toolbar, then select Fax Cover Page. The Select Fax Type window opens. Select a Fax Type from the drop-down and click Open. Fill in the fax cover page, then click Preview. 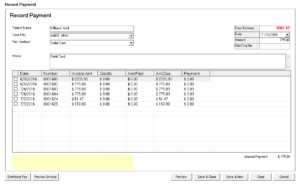 The batch billing feature allows to create hundreds of invoices at once. 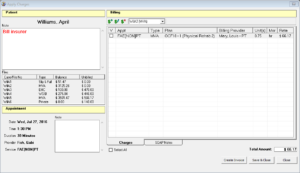 Before creating invoices in batch, one or more unbilled charges must exist (see Add and Manage Charges). To open the Batch Billing Manager, go to File > Batch Billing Manager. Click [New Batch] on the toolbar. To filter the list use Show, From, and To details then click Search. The Total is recalculated as the list is filtered. 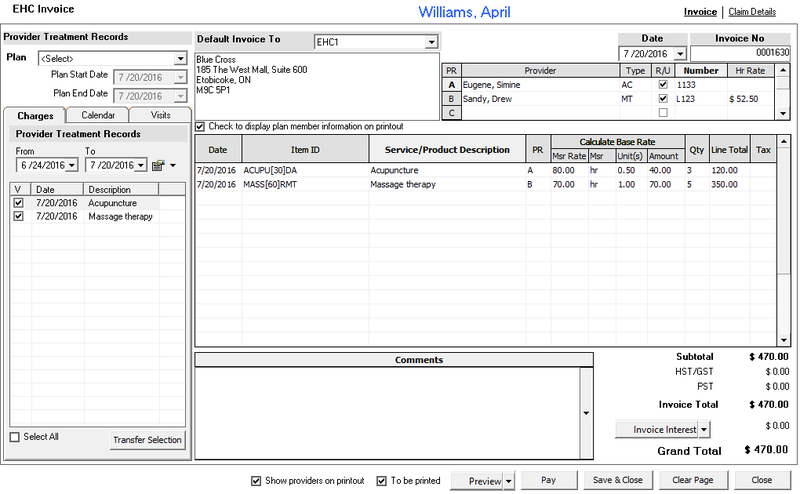 Change Invoice Date and Start from Invoice Number at the top-right corner. To set the invoice status to Sent, check Set to Sent as of box and specify the date. 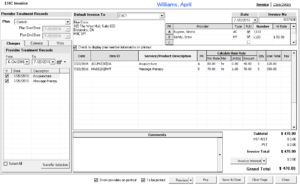 Add a Memo to appear in the Batch Billing Manager and Comments to appear within the invoice. Check the box for each patient you want to invoice in the batch, or check Select All. 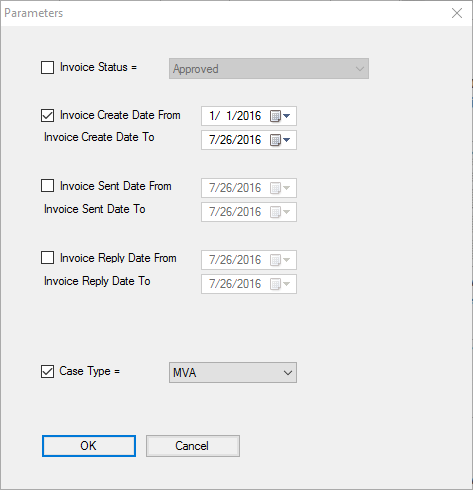 Use OCF-21 Options to customize the batch for MVA invoices. Note: For additional information about Batch Billing, please refer to Batch Billing article. You may attach files to Documents, Correspondence and Soap Notes sections of patient case. The table below will help you understand how to categorize and organize documents. Once attached, anyone who has access to this patient in Universal Office can see and view the file. Click [Attach] button on the toolbar. Locate and select file to upload, then click Open. Note: Depending on the correspondence type you selected, the system will open the respective window. See Correspondence Types table below. 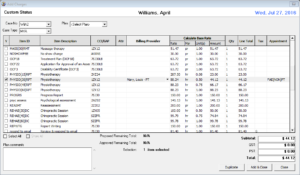 The Reports Manager has hundreds of statistical reports available from the online template library. Click [Tools] on the toolbar, then select Template Library. Select a Category from the pane on your left or use the search box. Locate the Report and click the [Download Report] button. Leave the parameters (if any) at their default value and click OK.
On the toolbar, click [Save]. The Save new report window opens. Select a group to store the report or click the New Group button to create one. Note: To learn more about reports, see Reports and Online Template Library section in our Help Centre.